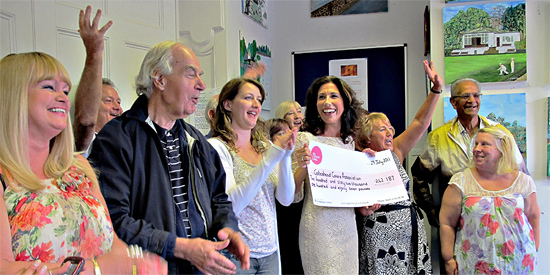 A lifeline support group for carers across Gateshead were given the surprise of their lives when former Corrie star and popular TV actress Gaynor Faye turned up on their doorstep waving a Lottery good cause cheque for a whopping £262,187. Celebrating the award with tears of joy Gateshead Carers Association received the funding under the Big Lottery Fund’s Reaching Communities programme which aims to support those most in need and help build stronger communities across the country. Audiences across the nation tuned in and shared the exciting moment which was broadcast on last week’s BBC 1 National Lottery: In it to Win it at 19.40 on Saturday, 6 August 2011.
said Steve Cowen, Chief Officer of Gateshead Carers. “Staff and carers present had no idea it was going to happen and the reaction said it all. There was everything from cheers, complete shock and amazement to tears of joy. I don’t think any of us will ever forget it. James Turner, Big Lottery Fund Head of Region for the North East said, “We are absolutely delighted to be able to support Gateshead Carers. It was brilliant for them to find out the good news with some extra excitement and celebrity, and it’s fantastic that a relatively small project in Gateshead can showcase their work on national television. Gateshead Carers will use the funding for a project to improve the quality of life for young carers, working carers and hidden carers from hard to reach groups across Gateshead, offering choices and control for carers to give them more independence, and enhance their health and wellbeing. The project will arrange respite breaks for newly identified carers to enjoy group activities including digital photography and art, and will work with other schemes that offer breaks for carers, such as the Princess Royal Trust. It will also promote awareness amongst employers of the needs of carers and the difficulties that working carers can face coping with a job as well as a caring role.